Today I opened the cupboard...and staring me down - challenging me - was a half-eaten jar of Nutella. I laugh in the face of half-eaten anything. I accept this challenge. Chocolate cake is a natural for this lovely hazelnut spread. I wanted to make the filling a bit more interesting, so I kept the buttercream in it's natural vanilla state and topped it with chopped hazelnuts. Part of my interest of continually improving my skills encouraged a bit of a bump up the next buttercream level. Instead of crumb coating the entire cake with the vanilla, I added a bit of Nutella so the thin white base layer of frosting would not be visible on the cake slice. I know. It's a teeny, tiny detail. But it was a choice I made. After letting it set-up in the cake fridge, it was time to frost. I've been waiting for just the right time to attempt a buttercream basket weave design...and was finally brave enough to try it today. We have a planned dinner out in a week or so and a sweet basket cake would be a lovely addition to the evening. Again, all my training is from a couple YouTube videos and much trial and error in the Test Kitchen. I plunged right in on this one. I had read some pointers on line, chief among them: take your time. This was good and I should have scheduled a break for myself (I will next time) because somewhere around the 70% done stage...the work was getting sloppy. Overall, I'm ok with this first attempt at a new technique. I hadn't really thought through to the top of the cake - when the basket was finished, I looked at my life partner with this sorta "now what?" shrug. So we walked to the market. Generally, bakers top the cake with flowers or fruit. This triple-berry combination is always a winner on a cake with buttercream. I am grateful that I had all the things necessary to bake this cake. 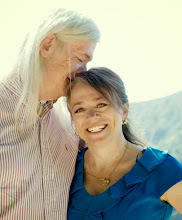 I am grateful for my dear husband; his patience and his support are invaluable. I love that my cakes don't have to be perfect. No white frosting except for the filling. I don't know why I want to bake cake. All I know is that it's still working for me - I can be creative and work with different flavors and colors. The medium of cake and buttercream makes for an endless series of combinations. I get to work with savory and sweet - at the same time! Whatever it does for me. I am relieved. Thank you. I appreciate all your help in the Cake Assessment and Knowledge Evaluation Department. Just when I think your creations can't get any better, you come up with this. Wow. Thanks Catherine - I learned so much practicing on this cake. I'm looking forward to the next one in about a week.